LAS VEGAS, April 19, 2018 /Christian Newswire/ -- Inspirational author and sports enthusiast, Richard LoPresto put readers on notice during the World Series when his Celestial Baseball Association announced plans to make a film based on his baseball book, "Old Timers Day As Told by God to Richard LoPresto." An epic tale about the forces of "Good vs. 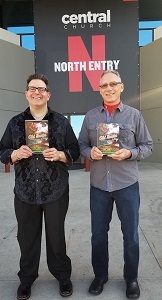 Evil," the book was inspired by and takes place at Central Church, a beautiful non-denominational megachurch headquartered in Henderson, Nevada. LoPresto will make his debut speaking appearance at Central Church on Saturday, May 5 and Sunday, May 6, 2018. The engagement will mark him gifting 500 autographed books toward a fundraising effort to provide the summer camp scholarships to children in need. The event will take place live during all four weekend experiences and will be available on demand beginning Sunday morning at www.centralonline.tv/media/. In "Old Timers Day," God Almighty and Satan the Devil face off and select their own major league baseball teams comprised of illustrious players, living and dead. Each agrees that once the game is in progress, neither of them can have anything whatsoever to do with the end result. The beloved pastime transforms into an extreme sport of 'Winner Takes All' as the instant the game is over, the loser, God Almighty or Satan the Devil, will be stricken from the mind of man and from the annals of history forever! The great game takes place at the legendary Ebbets Field, in the Flatbush section of Brooklyn, New York. "God literally gave me the vision for this book while I was sitting inside Central Church," reveals LoPresto. "I am deeply humbled to have witnessed with my own eyes, here on the Church's campus, the compelling saga that is revealed within the pages of the book! I am overjoyed to be able to share not only that life changing experience with the congregation but to also donate copies of the book knowing that young lives will be impacted with the knowledge of this tremendous family game." Founded in 1962, Central Church operates a 148,000-square-foot church building in Henderson, NV with ten additional locations around the world and a thriving online ministry including their God Behind Bars prison outreach program. Listed as the ninth largest church in the United States with a weekly attendance of over 21,000, the church's mission is to "Introduce people to Jesus and help them follow Him." Jud Wilhite is the dynamic senior pastor of the broadcast location. "Richard is one of our esteemed 'Generosity Rockstars,'" cites Geoff Sage, CFO and Pastor of Generosity and Giving at Central Church. "It has been astonishing to watch God work his plan through him. 'Old Timers Day' is an extraordinary read and God's voice and vision echoes in every word. We are excited to have him share his personal testimony and broadcast it around the world. His generous literary donation of books toward our fundraising campaign is an extra added blessing." "Old Timers Day" took LoPresto over seven years to complete. The author spent the last couple of years writing from a wheelchair and in rehabilitation on a walker and then a cane after suffering a debilitating injury. He reveals that God's voice kept him inspired even throughout the painful ordeal. "My injury actually turned out to be a blessing in disguise. Where some might have questioned God's intention, I never did. Those last couple of years provided me a great opportunity to focus on completing the book while allowing God to heal me," expresses Richard. "And through the grace and favor of my Lord and Savior and with the patient assistance of my best friend and mentor, Jerry Schafer, the award-winning writer, producer, and director, I was able to fulfill my mission." "Old Timers Day" is an immersive history lesson packing its storyline with amazing baseball tidbits and interesting historical facts, dating all the way back from the inception of baseball to the present. Veteran filmmaker Foster Corder has secured the film rights to "Old Timers Day" and recently completed the screenplay. "Old Timers Day As Told by God to Richard LoPresto" may in fact be of one of the best baseball stories ever told. The book is available on Amazon.com (a.co/hCZCJWy). Watch the book trailer here YouTube.com (youtu.be/rIh97HcaBZM). Listen to Richard LoPresto's Central Church presentation on Sunday morning, May 5 at www.centralonline.tv/media/.